Natural Tsavorite Gemstones and Custom Tsavorite Jewelry. Featured Tsavorite limited-time offers. Only 838 gems left. Tsavorite Garnet was discovered by British gem prospector Campbell R. Bridges in the mountains of north-east Tanzania in 1967. The name Tsavorite was chosen by Tiffany&Co in reference to the initial discoveries in the area in and around Tsavo National Park. A member of the garnet group, the species name is grossularite and the variety name is tsavorite. Tsavorite is considered to be the most valued variety of the grossularite species. Although Tsavorite is the name usually associated with the darker green garnets, there is no universally accepted standard that designates which shade of green qualifies a stone as tsavorite. It is interesting to note that since the darker material is from Kenya and the lighter colors are from Tanzania, the Kenyans insist that only the darker stones should be called Tsavorites. Today most of the tsavorite production is centered around Voi near the border of Kenya and Tanzania. Faceted gemstones over 3 cts, in size are considered to be very rare and valuable. Often called the Rolls-Royce of greens at Cadillac prices, tsavorite is 200 times more rare than emerald! It is also cleaner, more brilliant and not oiled or treated in any way. Tsavorites are relatively hard and are suitable for most jewelry designs. 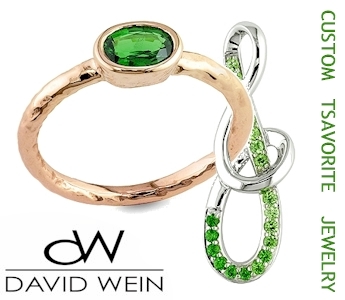 Looking for one of a kind custom tsavorite jewelry piece? Please find your tsavorite jewelry or visit our online jewelry workshop. Our approach to custom jewelry highlights the qualities of each individual gemstone to create a personalized design that enhances and respects the integrity of the stone.